My skin has been suffering quite a lot recently, with the change in temperature, cold air to central heating, and also some long haul flights, so I’ve had to really focus on perfecting my base. Ive been trying out some different foundations and concealers in order to hide any imperfections and I think I’ve finally found my perfect combination. I’ve been using the Clinique Superbalanced Makeup foundation along with Clarins Instant Concealer for areas that need more attention. I’ve also shifted the focus from my eyes, to my lips recently. 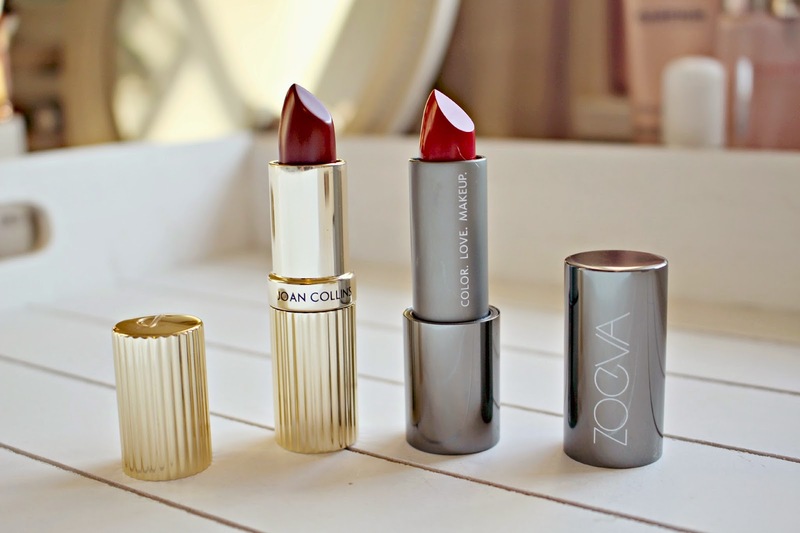 For this, I’ve fallen in love with two lipsticks in particular, both from brands that I’ve not tried before; Joan Collins and Zoeva. I have to admit I was quite surprised to learn of a Joan Collins makeup range and wasn’t quite sure what to expect, but the Divine Lipstick, which I have in the shade ‘Alexis’ is a luxurious creamy formula which also hydrates and leaves my lips feeling soft, full and of course full of colour. The shade itself is a wonderful deep plum and leaves a healthy shine upon application. The lasting power is around 4 hours even when I eat and drink, which is great for a colour this bold! The Divine Lips Lipstick is £18.00 from Joan Collins Beauty here. Another lipstick which I’m loving is the Zoeva Luxe Cream Lipstick in Cooling Passion. It’s also a caring lipstick, the vegan-friendly formula moisturises the lips so my lips don’t get so dry and chapped in the chilly weather. It feels sumptuous and luxurious to apply, the highly pigmented formula feels nourishing but is also packed with colour – and this shade of red is so wearable, especially for Blonde’s looking to add some more warmth to their complexion. The packaging as well is so luxurious, in a chunky metal tube with a magnetic snap-shut closure, it feels far more expensive than it’s £7.50 price tag! Available from Beauty Bay here. In order to make lips ‘pop’ the base has to be perfect. 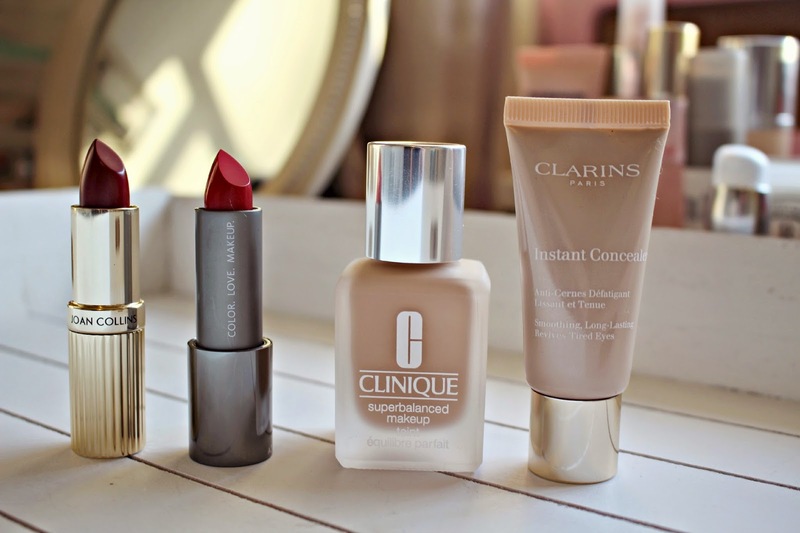 So after going through loads of foundations which just don’t work for me any more, I’ve settled on using the Clinique SuperBalanced Makeup foundation recently. The coverage is enough without being too heavy, and what I love the most about the formula is that it absorbs excess oil throughout the day, and also contains antioxidants and anti-irritants which help protect skin against pollutants and keep it healthy-looking. My only problem with this foundation is the bottle which you have to tip up in order to get any of the foundation out. Perhaps you can buy a pump? Let me know if I’m missing something!! The foundation is £22.50 from Clinique counters and also online. Finally, for some extra highlighting around the eye area (because dark circles and heavy lipstick are not a good look!) I reach for Clarins Instant Concealer. It’s become my concealer of choice for the eye area because of it’s blend-ability. I find my usual highlighters can settle into fine lines when my skin is dry from the cold, but the Clarins Instant concealer is light and smooth and it keeps my eyes looking refreshed the whole day. I think this product will last me for many years to come too – I use a dot the size of half a grain of rice, for BOTH eyes, so while £21.00 may sound like a lot for a tube of concealer, this one is for life. Almost. Available online here. For my eyes, I like to keep the look quite simple and I’ve pretty much been using the same products every day! To see my Everyday Autumn Eye look, take a peek at this post. Have you tried any of these products? What are your favourites for Perfect skin and bold lips? Next Post Blonde Hair SOS!